New York Times Bestselling author Jodi Picoult released her latest novel, Sing You Home, on March 1st. 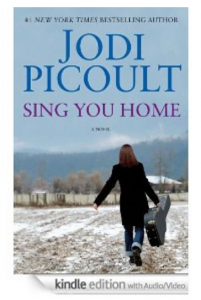 The cool part about the Kindle version of Sing You Home is that it includes a set of folk songs written by Picoult and sung by Ellen Wilber that apply to Zoe, the main character’s life. True to form, Picoult hits a controversial issue head on, and this time it is gay rights. She has written about high school shooting, the death penalty, sexual abuse, Asperger’s, and many others. Zoe, a music therapist who desires a large family, finds love with another woman and tries to have a baby, but ends up in a legal battle over embryos with her ex husband. It is fitting that she tackle’s the gay rights issue, especially with the recent recognition of legal unions in Hawaii and that it is a hot topic across the country with heavy debates on both sides. Jodi Picoult has an uncanny ability to provide a series of plots and weave them together. She also writes from different character’s “voices.” In some of her novels, even the text is different to portray that particular character’s personality. She is “real’ and really cares about her readers and the subject matters she uses, which is reflected in her writing. I also wrote another post on Jodi Picoult’s recently published short story, Leaving Home, and about her earlier novels that you should check out if you are interested. So, with that said, I think I’ll go grab my Kindle and get to reading. This entry was posted in Good Kindle Books At A Glance, NYT Best Sellers, Uncategorized and tagged Ellen Wilber, Jodi Picoult, Leaving Home, Sing You Home by holly. Bookmark the permalink. Wow. My kindle is showing that sing you home is not available. How did you get it? I’m so bummed! My kindle says it does not support the music- it’s a third generation with 3G- did I do something wrong?